Gloucestershire have signed right-arm pace bowler Andrew Tye for the 2016 Twenty20 Blast competition. The uncapped Australian, 29, starred for Perth Scorchers as they lifted the 2015 Big Bash title, including figures of 4-18 in the semi-final. Tye, who played second XI cricket for Somerset, Durham and Northants, has only appeared in 13 Twenty20 matches. "I have heard great things about the club, including from my Perth Scorchers team-mate Michael Klinger," Tye said. His form over the 2014-15 season earned him a contract with Indian Premier League side Chennai Super Kings earlier this year. 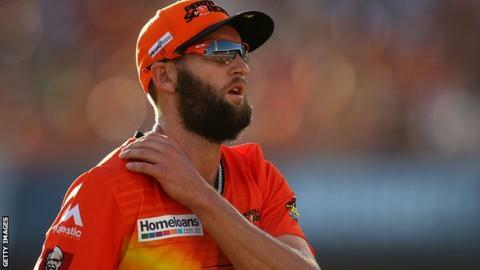 Gloucestershire head coach Richard Dawson said: "I saw him last year in the Big Bash where he was very impressive in helping Perth Scorchers win the competition. "We are looking to make improvements in T20 cricket for 2016 and to get through the group stages. Andrew will help us achieve that. He is a highly skilled bowler who will significantly add to our T20 cricket." Tye will be available for all 14 of Gloucestershire's group games which get under way on Friday, 20 May against Sussex Sharks at Bristol.